New software release has become available for testing, and user is excepted to quickly validate new release (“smoke testing”). User opens web browser to Tarantula web page and logs in. 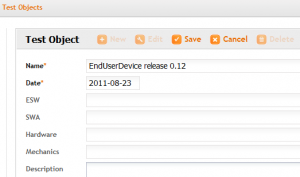 Tarantula opens to dashboard view displaying interesting statistics about current project. However, as we are in a hurry we do not have time to explore them right now. Instead we open case design mode to create new cases for new features. Design mode opens. On the left you see Navigator. Navigator is opened directly to Cases view, as selected from submenu. There are also views for Requirements, Sets, Executions and Test Objects. For now we will focus on Cases view. On the right side, you can see action buttons for manipulating cases. Press New button to create new case. Title: This is the most important field (and some would say its the only important field). We are creating test cases for new features, and we do not know yet how they are implemented. So for now, we give just some general info what needs to be tested. These will be refined later when have more knowledge. So the title could be for example. “Forgotten password link sends new password to given email address”. Date: Date will appear when test case was created. This is automatically filled, so no need to touch it now. Priority: Test case priority. This affects display order in navigator views. High is for high priority, Normal is normal priority and Low is used for low priority. We could also enter lot’s of additional information, define exact steps to run test case and even link case to requirements. But we are agile (lazy?) and will skip these. Press Save. New case appears on the navigator on the left. You can view cases by clicking on them. Next we define Test Object. It identifies actual “software/version/release” we are testing. Enter identifying name. E.g. Supox Client 4.23. Once again newly created object appears on navigator. Now we create (Test) Execution. Execution is a collection of test cases run for selected test object. So for each test object there may be several different executions. E.g. Smoke Test, Integration Test, Performace Tests etc. Enter identifying name. E.g. Smoke Test. Now we need to add some cases for our test execution. Make sure that Cases navigator is open on the left. If not, click on title to expand it. Move mouse over tag named “NeverTested” and hold down left mouse button,. Drag and drop tag to Cases section on Execution screen (bottom part). Dialog opens which asks to whom you will assign test cases. Assigning is not mandatory so you can just press Ok here without selecting anybody. Dropping Tag includes all cases, which have never been run before, to execution (and therefore includes cases which we have just created). If we have tagged some good smoke testing cases under “Smoke” tag, we can create new smoke test execution for existing and new features by simply dragging and dropping tags. Now it’s time for the real action, actual testing. Select Test from toolbar. Testing view opens. On the left there is once again explorer. On the top there is combobox for selecting execution to run. Explorer will load all cases assigned to test execution. You can click on cases to select particular case. Steps, including actions entering defect and comment. If BugTracker has been specified,found defect can be entered directly to selected tracker (Bugzilla or Jira) from here. It will be automatically “linked” to given Test Case and Step. There is also Not Run button for clearing any result. 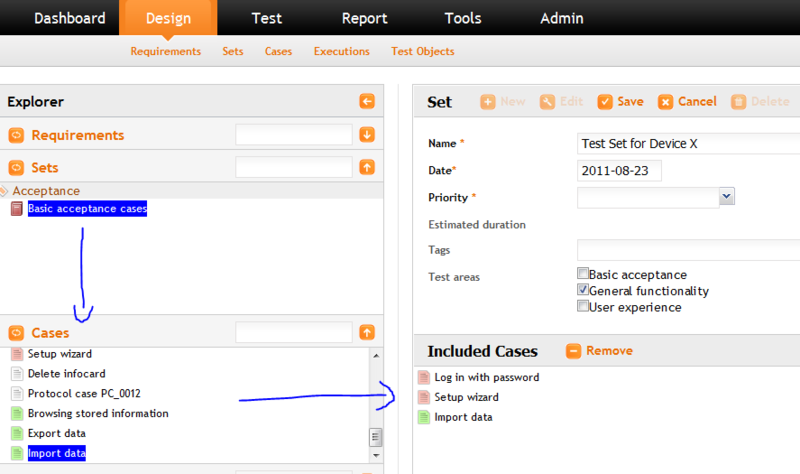 Navigator on the left will update to display result for entire test case (R column) after each change to step results. Please feel free to enter or modify some test results. After entering some case results, you can check status of your project. Dashboard (Available from top menu) offers quick status view to your report. It is based on Test Object, meaning that you can select particular “release/version” to be viewed. There are various metrics displayed, e.g. how testing is progressing, failed cases, testing and requirement coverage etc. There also various Reports available from toolbar. 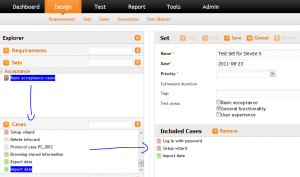 Case Execution List is also often used report. It gives detailed information about executed cases. Use Export Spreadsheet to export data to excel or openoffice for fine tuning report. This concludes our short tour with Tarantula. 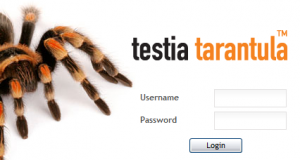 Hopefully you are now able to perform basic testing with Tarantula. Please explore this site for more tips how to utilize Tarantula!